Each day brings a new adventure in Hendricks County, and we have a whole weekend full of fun. This weekend even appears to have a break in high temps combined with a bevy of activities both indoors and out, so hop on over to any one of these enjoyable experiences in Hendricks County. 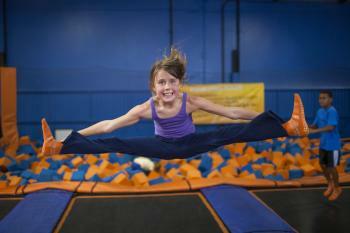 Every Friday from 7 to 11 p.m., bounce in to Sky Zone in Plainfield for a fun time in their Glow Zone. Trampoline fun with a twist of glow-in-the-dark entertainment; black lights, a laser light show, face painting and games! From 5-9 p.m., women will pay a discounted price for their studio fee (1/2 off) at uPaint Pottery Studio in Plainfield. Bring your friends, make it a girlfriends getaway for an evening and create a masterpiece. This is just the kind of escape we all need from time to time. Enjoy this festival at McCloud Nature Park in North Salem dedicated to pollinators. Master beekeepers will be on hand at the park to teach about the importance of the honey bee, demonstrate backyard beekeeping and let participants investigate a live hive. The event will include crafts, games and honey samples. Ice cream (make your own) and honey products will be available for sale. Support the Brownsburg senior community by participating in the Strides for Seniors 5K from 8 a.m. to noon at Williams Park in Brownsburg. All participants will receive a T-shirt, great exercise and the satisfaction in knowing you are helping a good cause. Then on Sunday, bring your favorite four-legged friend back to Williams Park for a day of fun meant just for them! Participate in a one-mile dog walk, contests, games, adoptions, a silent auction, vendor booths, food trucks, music and a Misty Eyes Ball Drop contest from 1 to 5 p.m.
Katy can be found out and about in Central Indiana pushing a giant stroller full of children. She was born and raised in Southern California by two parents who have an appetite for travel and exploration. Katy's genetic inclination to travel takes her to far off places and her love for all things Indiana brought about her website, Indy with Kids.